There’s something about me and Asian flavours. I feel like I was born to like Soy sauce. Add this sauce to my rice, soup, noodles and even my salad, and I will eat with a big smile. So, last weekend, I was raking my brains yet again, as to what to cook! Seriously, there’s no dearth of inspiration on the net, but there’s just so much in my kitchen, and only so much I can make of it. Cucumber is one thing you’ll always find in my fridge. English cucumber, to be precise. So, I happened to scroll for some recipes on YouTube, and I found this weird recipe of smashed cucumbers. Chef John of Food Wishes is one of my favourite YouTube food vloggers, and I loved how he made this salad, and I went ahead and tried it. You know, you always like the steps involved in a recipe, and the many ingredients that it calls for, but in reality, only simple recipes can save your day. Because when you’re really hungry, all that matters is how quickly you can cook up a dish. Raw dishes like salads are something I’ve always enjoyed. Contrary to my weight, which is extremely low, I should be eating fat, carbohydrate, protein and high-calorie food items. But, who cares! There’s something about the freshness, crunchy texture and dressing that I’m always lured towards all sorts of salads, and recently, Asian salads have taken the focal light. No wonder, sprinkle some toasted sesame seeds on my bowl, and I will never leave my salad. Okay, first things first, it’s not compulsory for you to take only cucumbers. You can always take more veggies like bell peppers and spring onions, for colour. But I liked how chef John made it, and I don’t want to disturb his dish much. I didn’t have rice vinegar, so I added lemon juice. And you can always add more seeds like toasted pumpkin or sunflower seeds to make it more healthy. It’s all about smashing the cucumbers. I covered mine with a muslin cloth, and lightly smashed the green boy with my pestle (copper hamam dasta). This is done to give you a taste of its natural flavour. Also, you don’t have to completely murder it. Just crush it from the middle and quickly cut it with a knife. 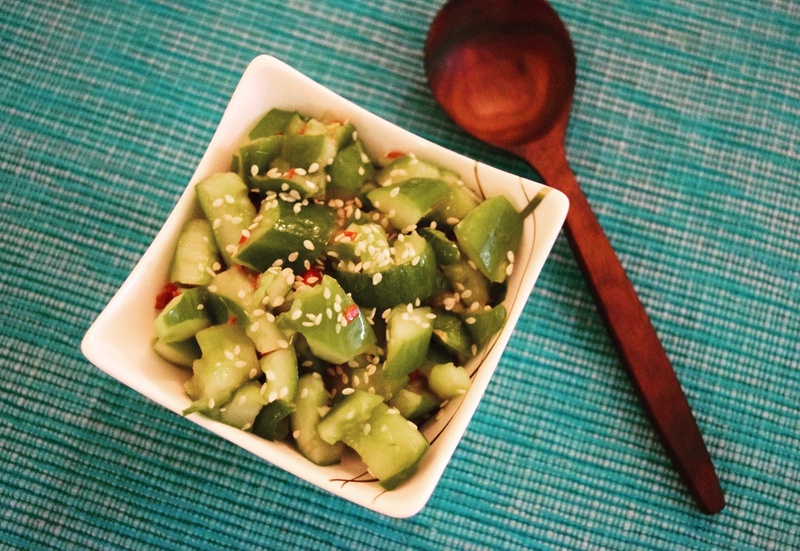 Add the chopped cucumber in a bowl, followed by the rest of the ingredients. Garnish it with toasted sesame seeds, but believe me, do as you please. You don’t have to follow any rules!